The Genting Casino Coventry Blaze suffered overtime disappointment for the third time in ten days as a quick strike from Glasgow Clan’s Matt Beca sent them home with a 5-4 defeat, but another road point added to their tally. 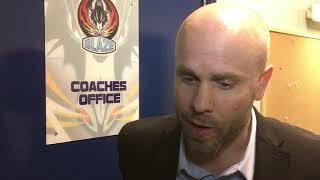 Blaze travelled the 312 miles without Shawn Pauly, Ross Venus and Miroslav Kopriva through injury. Czech forward Dominik Florian who was brought in to bolster the ranks ahead of last weekend remained in the line-up and Miika Wiikman who returned to action last Sunday following a long time out started in net. Alex Nikiforuk opened the scoring for Coventry on the powerplay at 3.34, his sixth straight away game with at least a point. Also scoring on their only chance with the man advantage in the opening period, Glasgow tied things through Scott Pitt on 12.28. The game wasn’t tied for long though as in-form Canadian Kelin Ainsworth registered (13.33) to give the away side a 1-2 lead after 20 minutes. At 26.46 with a second goal on the season, defenceman Chris Joyaux struck from the blue-line, an assist going to Tim Crowder, like Nikiforuk also on a six-game point streak away from home. Brendan Connolly (29.46) pulled Clan back within one before Scott Pott with a second on the powerplay made it 3-3 (32.34). Before the middle period was done, blue-liner Justin Hache, who rescued a point for Blaze against Fife Flyers with 4 seconds to go last time out made it 3-4 on the powerplay (37.48). After Scott Tanski rattled Wiikman’s cross-bar, Clan grabbed a third goal on the powerplay (3/3) with Josh Gratton adding to his two earlier assists to make it 4-4. With the buzzer sounding for 60 minutes, both teams got set for 3-on-3 overtime with a point each added to their name on the Elite League table. 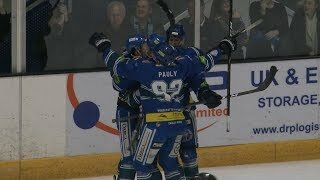 For the third consecutive time in the extra period, Blaze were subjected to defeat when Matt Beca, assisted by Brendan Connolly (1 goal, 3 assists) beat Wiikman 26 seconds in for a 5-4 final score.